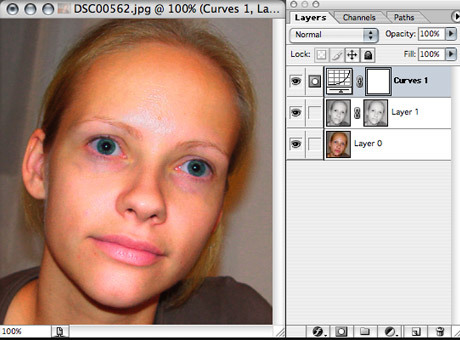 The following trick will make your portraits look just like the glamour shots you see in fashion magazines. In fact a similar technique is used by the retouch professionals at Penthouse. In this trick the objective is to retain the character of the model as much as possible. There are many ways to improve your portraits, including color correction, retouching and others, but the most important thing to do is to smoothen out the skin of your model. Frontal flash is probably the worst thing you can do to your model, it brings out all the imperfections of the skin. That's why I've picked such an image for this example. 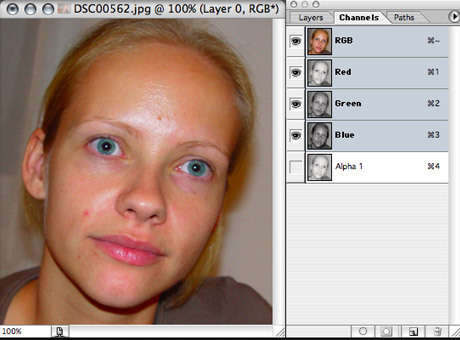 The red channel is the cleanest in skin tones, so we are going to use that to clean up our image. In Window/Channels select the Red channel (or press Apple-1) and press select all (or press Apple-A). Make a copy (Apple-C). Select the composite RGB channels (or press Apple-~). Go back to the layers window and paste the clipboard as a new layer (Apple-V). 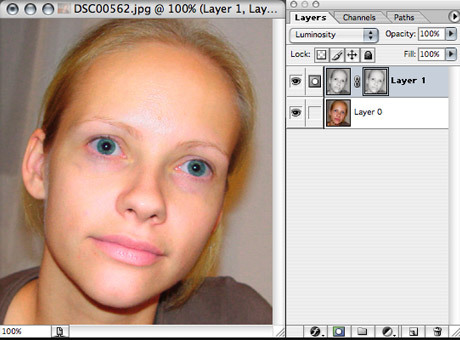 Select luminosity for the layer blending mode. Now we have to mask out this layer to retain the details of the face like eyes, lips, etc. To do this we will make a special selection based on the luminosity of the image by pressing Apple-Alt-~. Now select your top luminosity layer and apply a mask with your selection by clicking the second small icon from the left on the bottom of the layer window. To bring back some color to the face choose the layer effect/curves (fourth icon on from the left on the bottom of the layer window) and bring the middle of the curve down. And you're done. PHOTO CREDIT: Tunnel in Metro Detroit airport terminal that changes colors.